LG has already released a couple of "Friends" with its G5, with mitigated usability and user response. Having tried four of them, I can assure you that my absolute favorite is the LG 360 Cam, not only because of its super cool and "immersion" feel, but also because of its relative independence from the G5 and the fact that it works with different Android and iOS devices. This seems to be the case for this newly announced "Friend" too. 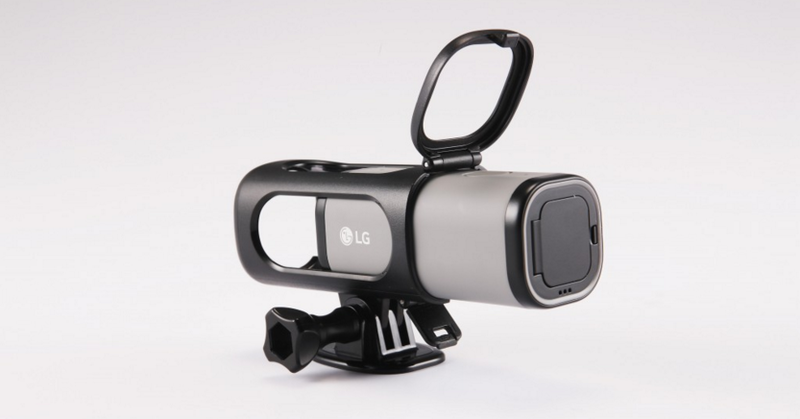 The LG Action Cam LTE is a standalone rugged action camera with IP-67 water, dust, and sand-resistance (up to 1m of water for up to 30mins), as well as WiFi and LTE connectivity to live stream to YouTube Live. It comes with a mount that helps you attach it to helmets, cars, and other moving objects. There's an Android app to view live footage from it, manage its settings, and offload photos and videos from it. The camera will also later receive a firmware update that will allow it to be used as a CCTV for home monitoring. The Action Cam LTE will begin shipping in South Korea today, with more markets to follow later. There are no further details on price or exact availability.